The flood of folk compilations just keeps coming. And we are far from there being talk of any new trend set to take its place. JAZZANOVA have a relaxed attitude to the debate on folk 'cause they neither claim to be the founding fathers of the movement nor do they let themselves be pressurized into having to do anything word changing in the area. In most cases this is when the real magic starts to happen - precisely when you don’t try too hard. The proof that they have something worthwhile in the folk scene is that Secret Love, which is now on the third in the series, has progressed from being an insider-tip to an institution. Together with their buddy RESOUL who runs the Berlin record store Soultrade and TRUE BEATZ COLLEKTIVE, they have again searched out undiscovered jems of the folk scene. In the folk section of most record stores you can find a very broad palette of varied music from rock, to electronic and brazilian tunes. The goal of this compilation is by no means to solve the puzzle of what is meant by the term "folk", as many will upon listening to it ask what it has to do with folk-music. Similar to jazz and soul, the term is much more an attempt to try and pigeon hole that which cannot be catagorised. Its much more about bringing together the music that many DJs hear removed from the dance floor. 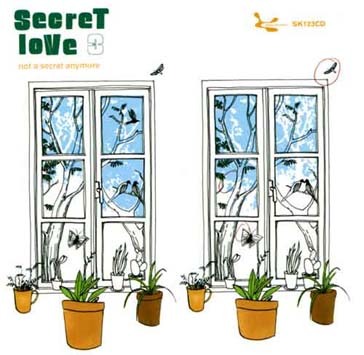 "Secret Love" is something of a mix tape for a loved one, even if there is no one particular person in mind. Still one or two anecdotes deserve mention. So for example, POLA are swiss friends of ALEX BARCK from JAZZANOVA's neighbours. Other than writing the music for CHISTOPH SCHLINGENSIEFS latest theater production they have also just made a really nice album which will unfortunately only be available in their homeland. THIEF already had a track on the first installment of Secret Love. "Does It Make Any Sense" is something to look forward to from their forthcoming album. Englishman FINK had a surprisingly good debut album "Biscuits" on COLDCUT's Label Ninja Tune. For Secret Love he did an exclusive version of "Pretty Little Thing" which is only available on this compilation. Ninja label colleagues MAX & HARRVEY contribute their track "Sleep" which was previously only available on 10" and makes a good lullaby. ANDRE ZIMMER is the latest project from Sonar Kollektiv family members DANIEL PAUL & DJ HONESTY (also on swedish label Brandy) aka SLOPE. FUJIYA & MIYAGI proved with their album on Tirk that they go beyond the boundaries (though exactly which boundaries it is not clear) and it's not always just about an electronic interpretation of camp-fire romantic. Following her recent more club orientated album "All I Can Provide", CLARA HILL is now striving in a more acoustic orientated song writing direction. She delivers an exclusive preview with the track "Once I Know". KIRK DEGIORGIO and his new project THE BEAUTY ROOM just couldn't have been left out. Especially after he worked on "Holding On" with DEODATO, who has already arranged for FRANK SINATRA and ARETHA FRANKLIN. One no longer needs to say much about swedish superstar JOSÉ GONZÁLEZ - his album "Veneer" has sold more than 400 000 copies in Great Britain alone. The same goes for TUNNG (Static Caravan) from england who were already represented on the second edition of Secret Love. With their track "Jenny Again" they provide a perfect homage to Sonar Kollektiv office manager Jenny Hülsmeier who was responsible for licensing on this compilation and so its appropriate that she be honour. Sans se réclamer comme les pères de cette nouvelle vague mais toujours dans l’actualité les JAZZANOVA nous livrent le 3ème volume de SECRET LOVE avec la tendance folk électro et réunissant quelques uns des plus beaux titres du genre. Non seulement cette compilation réunit plusieurs des meilleurs tracks du genre, mais en plus tous possèdent un lien avec Sonar Kollektiv et Jazzanova. Que ce soit Pola qui se trouve être voisine de Alex (membre des Jazzanova), Clara Hill qui a déjà sorti 2 albums sur Sonar Kollektiv, FINK prodige du label de COLCUT NINJA TUNE et dont un titre figurait sur le premier volume de la série… On y retrouve bien sur JOSE GONZALEZ qui a vendu plus 400.000 albums juste sur le territoire anglais, Milosh (adulé par MADONNA et BJORK) …. Bref c’est un modèle du genre.